Description (GR): "Blaze is tired of spending her life on the sidelines. All she wants is for Mark the Soccer Stud to notice her. Not as Josh's weird sister who drives a turd-brown minivan. And not as that nerdy girl who draws comics. What she gets is her very own arch-nemesis. Mark may have humiliated Blaze supervillian-style, but what he doesn't know is how geek girls always get revenge. This book is NOT bad. That's the first thing I want to say. It's just so... underdeveloped that I was disappointed and couldn't really connect with the characters. The premise, however, was interesting. Basically I had a problem with the length of the book (less than 200 pages) because it didn't allow for the story to be properly developed. There was so much the author could have done with the characters, so much depth she could have added to their... character. She could have explored Mark's past better; she could have explored Blaze's feelings about her parent's divorce better; she could have explored Blaze's and Quentin's relationship (she could actually have included it in the book). Blaze herself deserved more development. The entire issue(s) raised by this book deserved more development, to be better and more deeply explored (I'm not saying the book had to be bleak... but some serious moments among the predominantly humorous moments would have made this book so much more interesting) and more "closure" than they got. As it was, I couldn't really connect with the characters. I felt like only Blaze and Josh (her younger brother) were really more then cardboard cutouts (which I felt the rest of the characters were; just there to fill the book with... characters), but even them lacked development. I don't know. This could have been a really good book about double standards based on gender in our society, the dangers of social media, etc. But... it needed more development and a bit more depth. 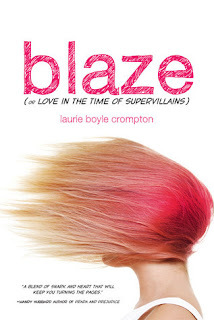 As it was, I thought it was a quick, fluffy read and Blaze's love of comics was awesome, but that's all this book was... and it could have been so much more. Overall... a quick, fluffy read that could have been so much more.